Quinnipiac heads into the final weekend of the regular season currently in the 5th spot in the ECAC standings. After a 6-1-1 start in ECAC play, the Bobcats have gone 5-7 in the conference since the hot start which has hurt their chances at a top four spot and a first round playoff bye. The Bobcats head into the final weekend against Yale and Brown with an outside chance at a first round bye. They will need help in order to get the last first round bye. The Bobcats can finish as high as fourth or finish as low as sixth in the conference standings depending on how the final weekend plays out. Let's take a look at the Bobcats scenarios and then the rest of the league. How the Bobcats can get into fourth and a first round bye? Quinnipiac wins at home against Yale on Friday and Brown on Saturday. Saint Lawrence loses on Friday at Dartmouth and Saturday at Harvard. How the Bobcats can finish in the fifth spot? Any Saint Lawrence win or tie this weekend would eliminate Quinnipiac from a first round bye. Quinnipiac wins against Yale on Friday and Brown on Saturday. Any Quinnipiac win coupled with a Clarkson loss or tie against either Harvard or Dartmouth. How can the Bobcats finish in the sixth spot? In the second scenario both teams would finish with an 11-8-3 conference record and this would go to the third ECAC tiebreaker since they split the season series and both would have the same number of conference wins which are the first two tiebreakers. The third tiebreaker is a comparison of results of games against the top four teams. Quinnipiac finished the season 2-5-1 against Union, Harvard, Cornell and Saint Lawrence while Clarkson is 2-3-2 against the same teams with Harvard still on the schedule. If the Bobcats can get a first round bye that would avoid a likely quarterfinal trip to Appleton Arena and would likely bring Saint Lawrence (should they beat Brown in the 1st round) to High Point Solutions Arena for the quarterfinals. As the number five seed Quinnipiac is looking at hosting Brown in the first round. They play Brown Saturday and then may need to play them a maximum of three more times the following weekend. If Quinnipiac falls to the sixth seed then they are likely going to host RPI a team they swept this season and have played very well against in the last five years. In its ECAC tournament history, Quinnipiac has only reached the ECAC final four one time without having a first round bye. 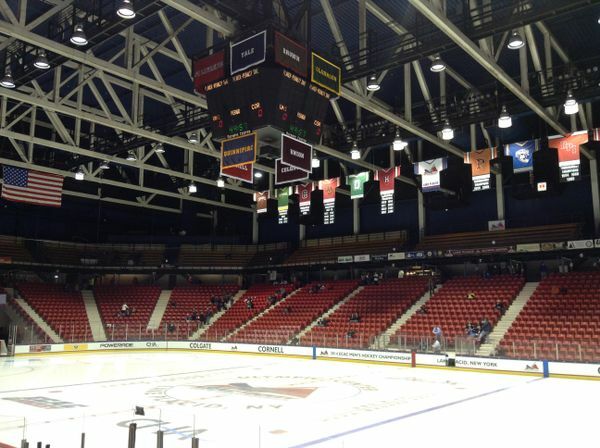 In 2007 as the number five seed they defeated Union in the opening round in a sweep before sweeping fourth seeded Cornell on the road at Lynah Rink before upsetting top seeded Saint Lawrence in the semi-finals in Albany. Quinnipiac then fell to the second seed Clarkson after coughing up a two goal third period lead losing 4-2 to the Golden Knights. Union currently leads the ECAC with 31 points. They can win the Cleary Cup by winning out. They could also finish in second place or as low as third place. Harvard is in second place with 30 points and would win the ECAC by winning out and Union losing one game. The Crimson would win the third tiebreaker against Union should the teams end up tied which is common games against the top four teams. They can finish anywhere from first to third. Cornell has an outside chance at the Cleary Cup needing to win two games this weekend, having both Union and Harvard losing out in the process. The Big Red can finish anywhere from first to third but its probable they finish in third place. Saturday's game against Union could be for the ECAC championship if things break right for the Big Red with the scenario I played out above. Saint Lawrence cannot finish any higher than fourth and no lower than fifth. One point clinches a top four spot and a first round bye for the Saints. Clarkson currently sixth can finish as high as fifth or as a low as seventh. Finishing fifth would set up a possible quarterfinal match-up with arch rival Saint Lawrence. Finishing sixth they would likely play RPI in the first round while as the seventh seed they could face either Yale, Dartmouth, Princeton or Colgate depending on how the weekend shakes out. Yale could finish as high as sixth but as low as tenth depending on how the weekend shakes out. Dartmouth can finish as high as seventh but drop as low as the tenth spot depending on the results of the weekend. Princeton and Colgate are in the same boat as Dartmouth in that they can each reach the seventh spot or finish in tenth. RPI cannot finish any higher than eleventh but can still drop to the twelve spot depending on how they fare and Brown fares this weekend. Most likely they remain in eleventh. Brown currently in the twelve spot has to play Princeton and Quinnipiac on the road which are both tough matchups. They can finish as high as eleventh but its likely they will finish where they are now in the standings.